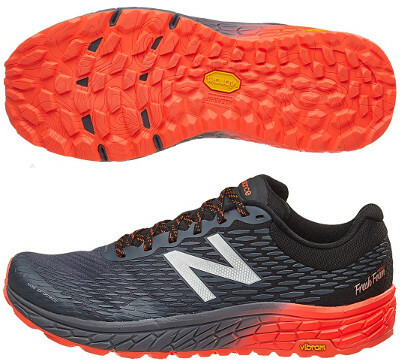 New Balance Fresh Foam Hierro v2 are neutral trail running shoes. The New Balance Fresh Foam Hierro v2 is the result of combining best features from early adopter Fresh Foam Hierro and popular Leadville v3. On one side, the latest development from Fresh Foam technology and 4 mm drop for a more agile transition. On the other side, all the experience and user feedback from one of the most popular trail running shoes with acceptable weight and awesome Vibram™ outsole. Upper from Fresh Foam Hierro v2 reminds of the Boracay v3 one with 3D screen printed synthetic fabric which would need feedback from unbiased runners to check performance regarding fit and breathability but is definitely a disruptive eye-candy one. Although not really a bootie interior, soft materials and gusseted tongue provide great comfort and prevent debris and dust from jumping inside. Toe cap enjoys superb reinforcement to effectively protect against rocks when running offroad. Classical New Balance logo is made of reflective material to improve visibility under poor light conditions. Impressive Fresh Foam midsole features significant height following trend from maximal trail running shoes like those from Hoka. In Fresh Foam Hierro v2 the Fresh Foam is more flexible with different shapes depending on area to optimize cushioning performance. Another highlight is the Vibram™ MegaGrip outsole which guarantees great traction with big lugs and get rids of typical rigid rock plate to promote flexibility and smooth transition.